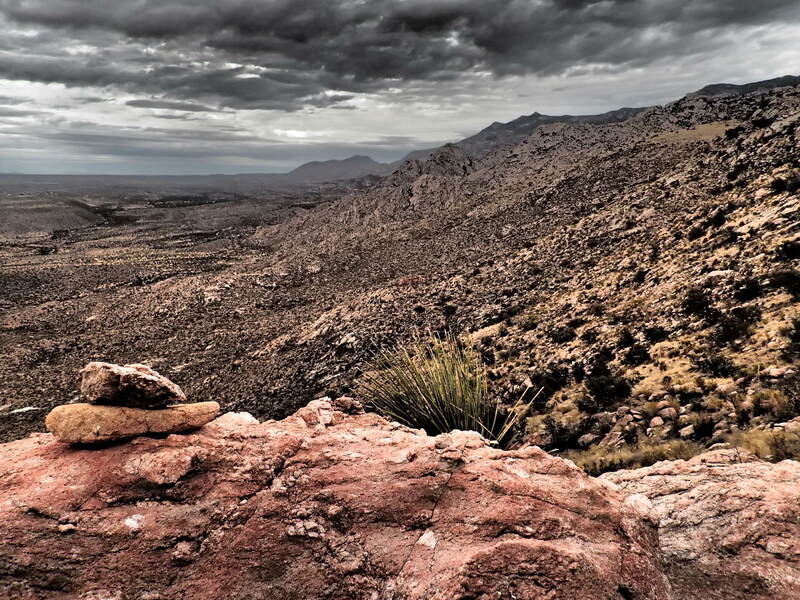 I had originally planned on hiking Pusch Peak from Pima Canyon until I came across this description http://hikearizona.com/decoder.php?ZTN=17807 on HikeArizona.com the night before. I really enjoyed my hike up Buster last year and wanted to see more of the area. So glad I hiked this one and covered some new ground instead- the trail up to Peak 4223 was delightful with fantastic views! I love autumn days when I can start my hike at noon. The weather was wonderful all day, sometimes overcast, sometimes breezy. Found the trail with no issues- it is very well cairned with good tread and hardly any poky things- almost seemed too easy! 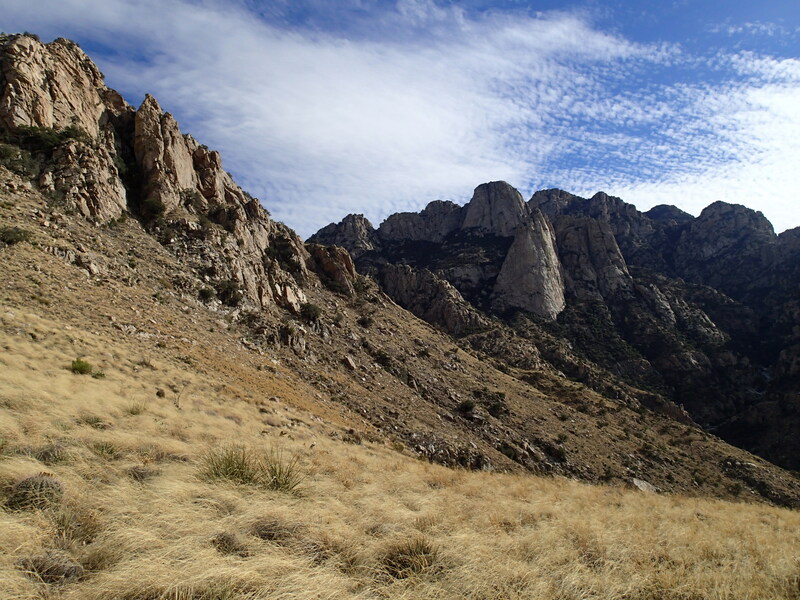 Interesting views of the Romero Canyon Trail and Samaniego Ridge. 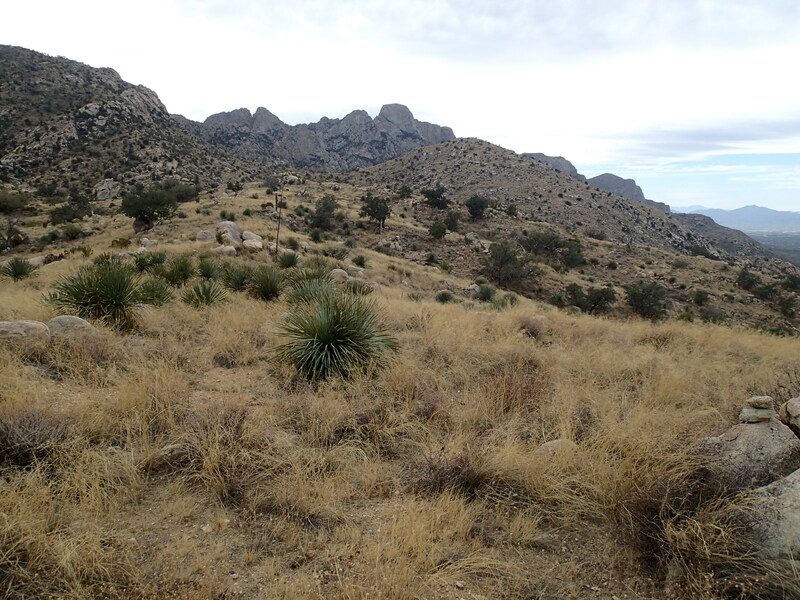 I passed Peak 4223 and made my way across the ridge to the low saddle. I saw a flurry of activity and got really excited for a second- was it one of the newly released bighorns? Sadly, no. Just some deer. 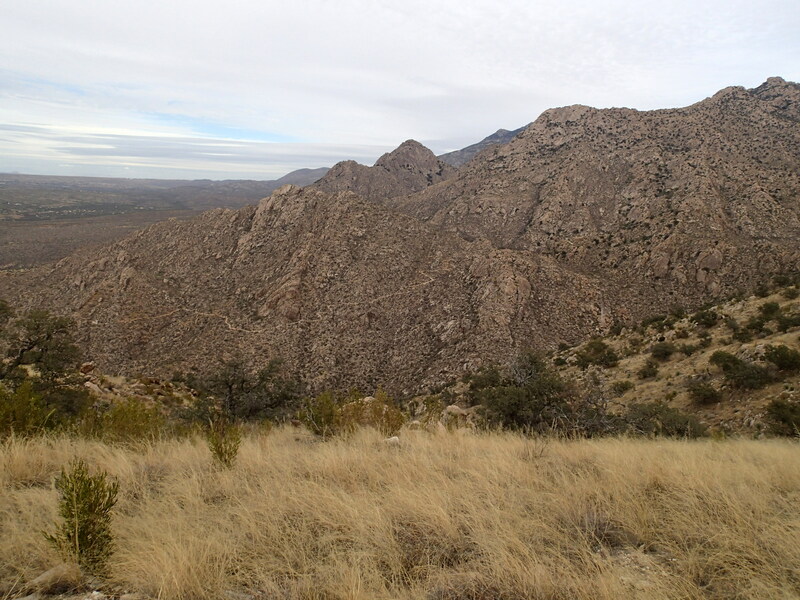 After looking at dry Buster Spring I contoured around to meet the saddle to the east of Buster. There was no trail, but occasional cairns popped up from time to time. Thankfully the grass seeds weren’t too bad, that can turn a hike into a foot-stabbing nightmare quick. 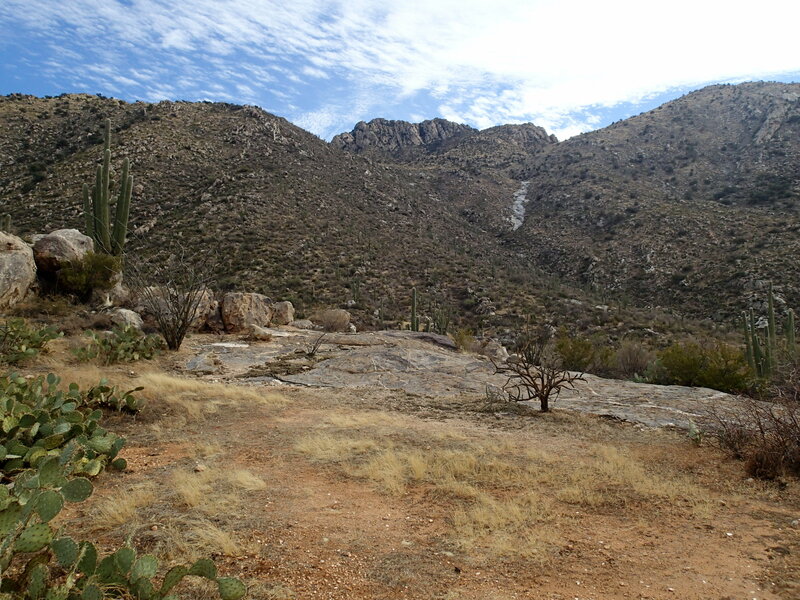 Also, not much shindagger on this route, not like areas in Pima Canyon where you are shindagger-surfing. Speaking of which, I had a great view of Table Mountain’s summit where Wendy and I spent a chilly night last year by the fireplace. 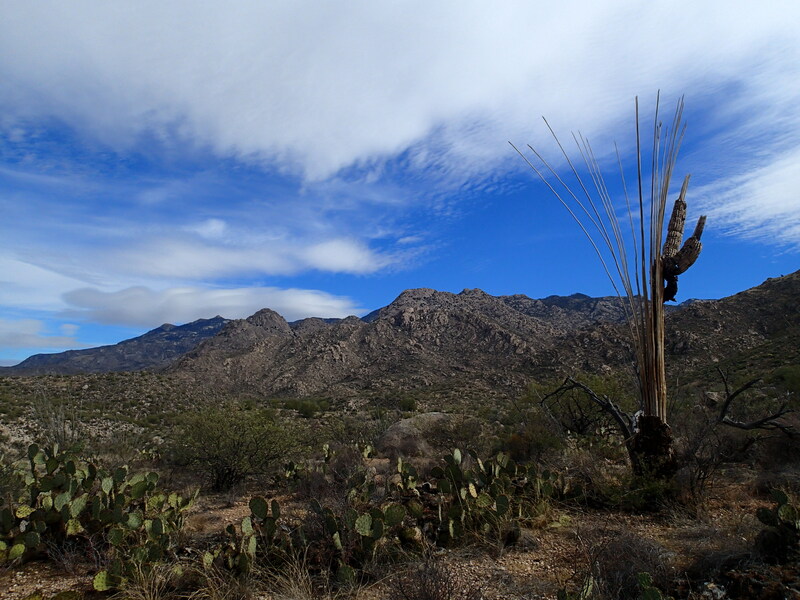 The views into Alamo Canyon are some of my favorite in all the Catalinas, so dramatic with the massive Leviathan and Wilderness Domes. 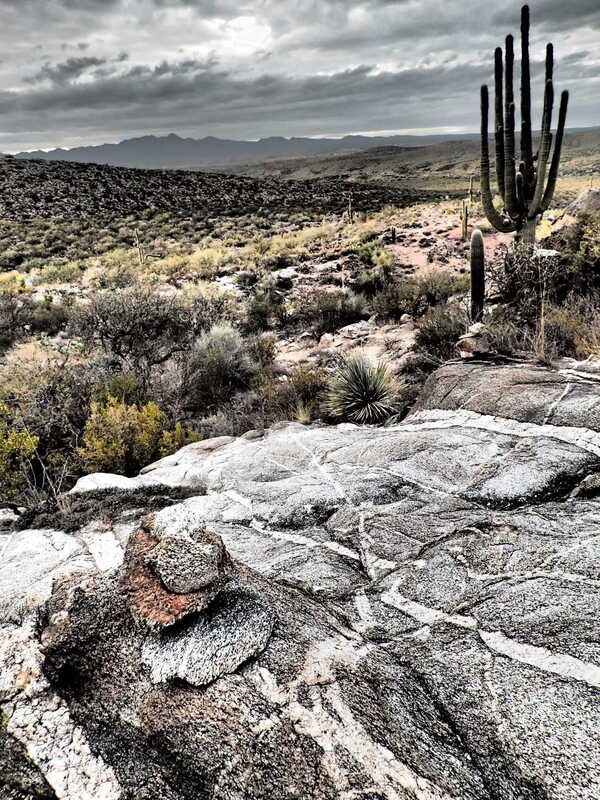 The saddle felt remote, Buster blocked out civilization beyond, the sprawl of Oro Valley pink-tiled roofs. One last short steep bit to the summit and I settled in for a long break. It was windy, but not cold. I loved that there was very little chance that I’d see anyone else today, even though the first parking lot was full. After an enjoyable time on the summit, reading old logs and listening to music, I started down the east side. The small saddle below the summit really speaks to me and I stopped again. 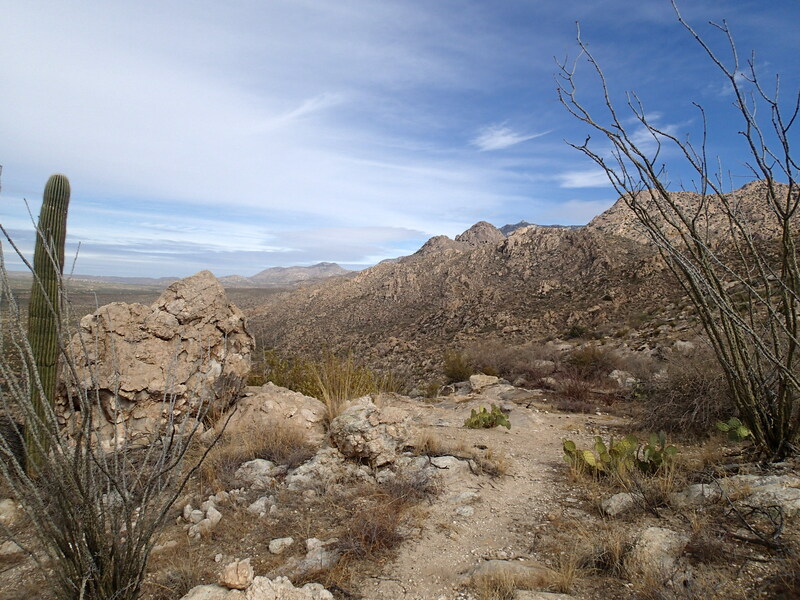 Spent time playing with my camera settings and investigating a cairned route that I think connects up with the trail in Alamo Canyon. Micro Chicken is getting close to his second birthday. And yes- I’m wearing sparkly nail polish. Don’t judge. Though details are slim, the history of this immediate area seems to revolve around the late Buster Bailey. Buster moved here from Texas in 1927. 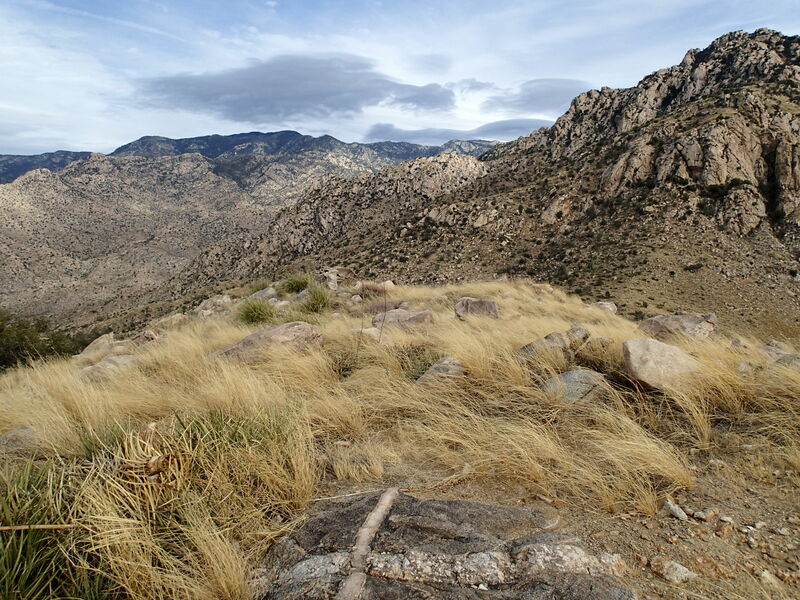 His father built their home somewhere in the area that is now Catalina State Park. 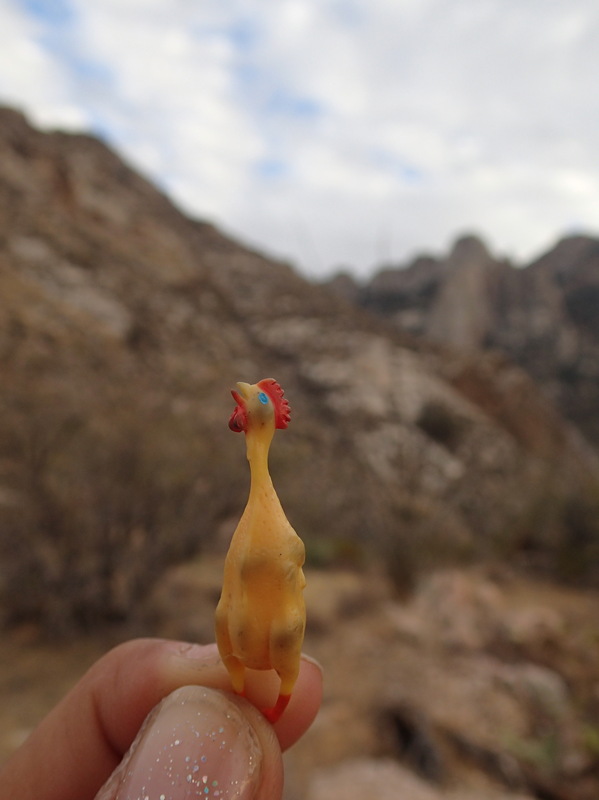 Buster’s family soon moved back to Texas, but Buster returned to his one true love, The Catalina Mountains. He worked for area ranchers, he worked for the Zimmerman family, who developed what is now Summer Haven on Mt. Lemmon, but Buster’s real claim to fame was as a bootlegger, operating his still near the waters of the now dry Buster Spring. Remnants of his still are said to be in place, though in disrepair, somewhere near the current spring. 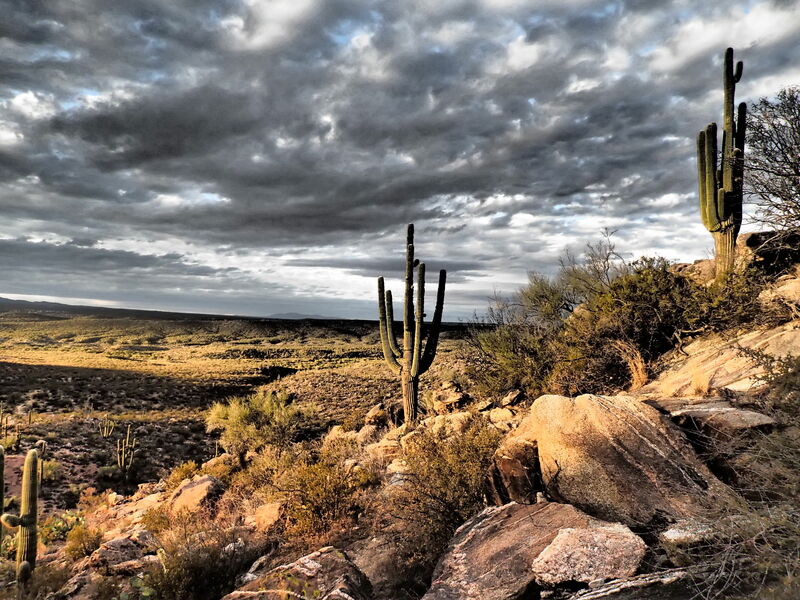 This was Buster’s stomping ground, and you just can’t help but feel connected to him while you’re here. It’s said that he packed his product down alternating routes, so not to leave any obvious trails. 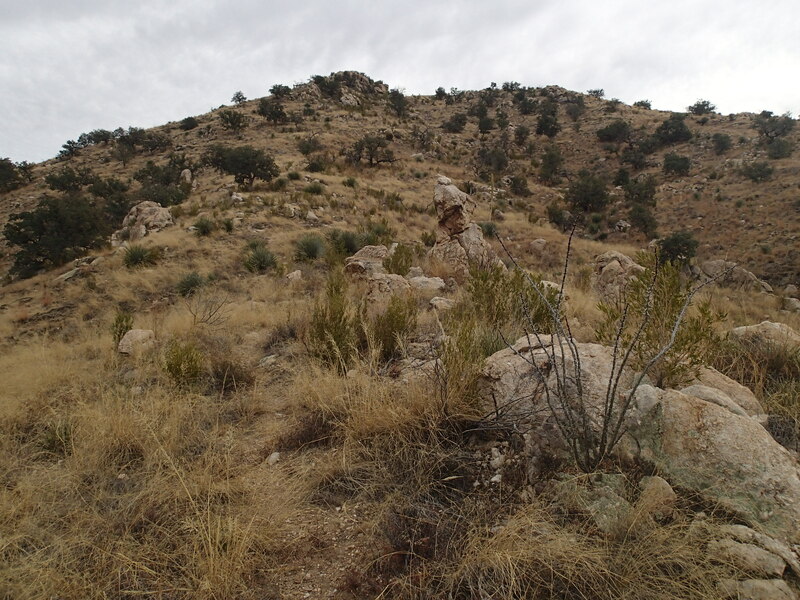 It would be safe to say that if you’re on any passable route in or around Buster Canyon, Buster, himself had been there. 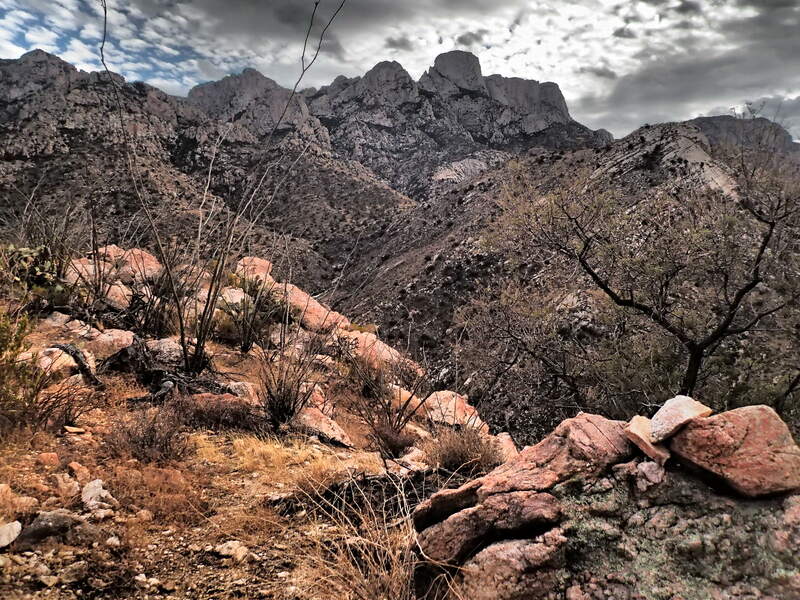 I really needed a day like this- just me and the Catalinas. 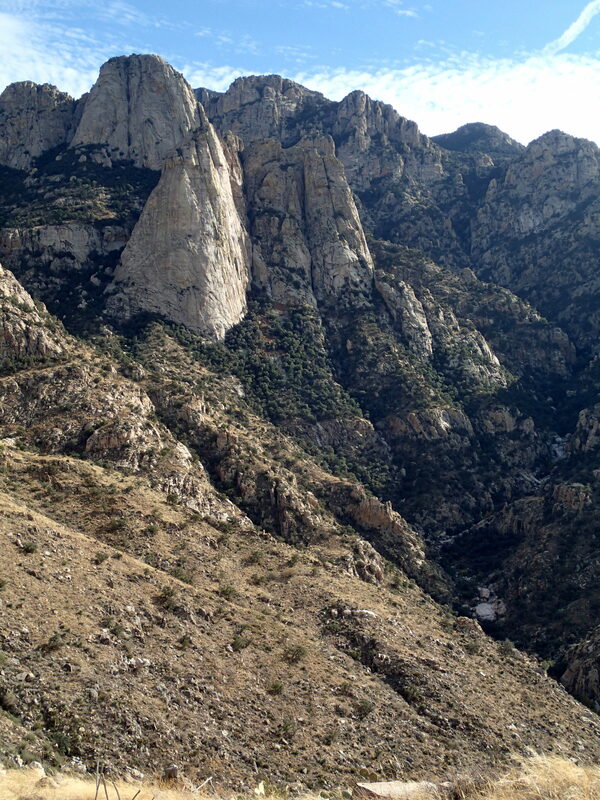 What a great route, I’ll have to check out the Alamo Canyon variation sometime. 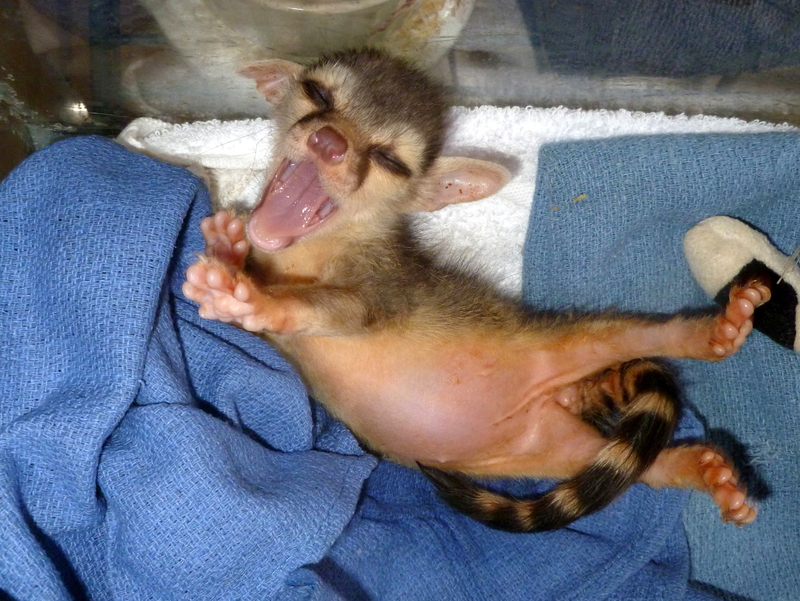 In Wildlife Rehab news, I came across this picture from of a baby ringtail that we raised that was sent to an educational facility. Look at that yawn!! Donations go toward housing and feeding the animals at Wildlife Rehabilitation Northwest Tucson.